A year ago this month, ELVES started operating as the approved compliance scheme for end-of-life vehicles in Ireland. Our first year of operations has seen us make good progress on establishing an ELVES Network of permitted scrapyards (Authorised Treatment Facilities – ATFs) all over Ireland. We now have a strong geographic coverage with 48 ATFs in the Network. If you are registered with Revenue, have a TAN, and sell used previously un-registered vehicles (M1 & N1) to an Irish driver in Ireland, then you are obligated under the ELV Regulations. ELVES is accepting membership applications from undertakings that manufacture (new) and/ or supply (used) vehicles to the first consumer (the first title holder or driver of the vehicle) in the State. 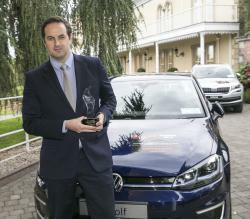 Congratulations to the Volkswagen e-Golf for winning the Irish Green Fleet Car Award sponsored by ELVES at this year's Fleet Car Awards. A facelifted Golf went on sale earlier this year, and with it came an updated version of its all-electric e-Golf. Now capable of offering a range of up to 300km compared to the previous 200km, it’s also more powerful and boasts all the renowned comforts and refinements of the regular Golf. Accepting the award for Irish Green Fleet Car of the Year 2018 – Paddy Comyn Volkswagen Ireland. How is a Car Recycled? Before receiving our approval ELVES was busy looking at what happens to a vehicle when it is recycled in Ireland. We undertook a trial involving the recycling of 201 scrap cars and small vans. The trial looked at the recycling process, focusing on the metal that is recycled from a end-of-life vehicle. You can read the results of the trial here in our report. Video may have killed the radio star, but the new ELVES radio advert may just bring it back to life. Playing on programmes like Moncreiffe and Off the Ball since the start of July, the adverts are part of the ELVES advertising campaign to improve awareness of the way to scrap a vehicle and promote the ATFs in our network. Are you an importer of M1 or N1 new or used vehicles? If so, you have obligations under the ELV Regulations. Many importers are aware they that they have obligations to provide take back solutions for their vehicles when they become a waste and now is the time to act. ELVES can help you understand your obligations and provide a simple, practical, and cost effective way to meet them. Yesterday, Thursday the 25th May, Minister Denis Naughten officially launched ELVES in Athlone. All the recyclers in the ELVES Network are Authorised Treatment Facilities and our network is growing.